ESP increases the car's stability. It reduces the tendency to skid and improves the stability and roadholding of the vehicle. ESP detects critical handling situations, such as understeer, oversteer and wheelspin on the driven wheels. It stabilises the vehicle by braking individual wheels or by reducing the engine torque. The warning lamp in the instrument cluster starts flashing as soon as the ESP intervenes. The ESP incorporates the functions of the anti-lock brake system (ABS), the traction control system (ASR), the electronic differential lock (EDL) and the dynamic steering*. ABS prevents the wheels from locking up under braking until the vehicle has reached a virtual standstill. You can continue to steer the vehicle even when the brakes are on full. Keep your foot on the brake pedal and do not pump the brakes. You will feel the brake pedal pulsate while the anti-lock brake system is working. The brake assist system can speed up the braking process and shorten the braking distance. It automatically boosts the braking force if you press the brake pedal quickly in an emergency. On vehicles with adaptive cruise control*, the brake assist system will build up a small amount of pressure in the hydraulic brake system if it senses that you are too close to the vehicle in front. In the event of wheelspin, the traction control system reduces the engine torque to match the amount of grip available. This helps the car to start moving, accelerate or climb a gradient. When the EDL detects wheelspin, it brakes the spinning wheel and directs the power to the other driven wheel (or wheels on quattro* versions). This function is active up to about 100 km/h. To prevent the disc brake of the braked wheel from overheating, the EDL cuts out automatically if subjected to excessive loads. The vehicle can still be driven. The EDL will switch on again automatically when the brake has cooled down. On vehicles with dynamic steering*, the ESP can also intervene in the steering to stabilise the vehicle in critical situations. • The grip provided by the ESP, ABS, ASR, EDL and dynamic steering* systems is still subject to the physical limits of adhesion. Always bear this in mind, especially on wet or slippery roads. If you notice the systems cutting in, you should reduce your speed immediately to suit the road and traffic conditions. Do not let the extra safety provided tempt you into taking any risks when driving – this can cause accidents. • Please remember that the accident risk always increases if you drive fast, especially in corners or on a slippery road, or if you follow too close behind the vehicle in front of you. Please bear in mind that even ESP, ABS, brake assist, EDL, ASR and dynamic steering* cannot compensate for the increased accident risk. • When accelerating on a uniformly slippery surface (for instance all four wheels on ice or snow), press the accelerator gradually and carefully. The driven wheels may otherwise start to spin (in spite of the integrated control systems), which would impair the car's stability and could lead to an accident. • To ensure that the ASR works properly, all four wheels must be fitted with identical tyres. Any differences in the rolling radius of the tyres can cause the system to reduce engine power when this is not desired. • Should a malfunction occur in the ABS or EDL, both the ABS warning lamp and the ESP warning lamp will light up. • In the event of a malfunction in the ESP system, the warning lamp will light up. • If a malfunction should occur in the ABS, the ESP, EDL and ASR will also be out of action. • The systems can make noises when they intervene. The ESP is switched on automatically when the engine is started. Press the button briefly ⇒ fig. 232 or ⇒ fig. 233. 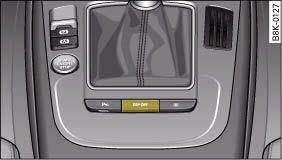 The warning lamp will light up and the message ASR off will appear in the driver information system display. The traction control system (ASR) can only be switched off at speeds below 50 km/h on vehicles with front-wheel drive. At 70 km/h it will switch on again automatically. The ASR can be deactivated at any speed on vehicles with four-wheel drive. Press the button for longer than 3 seconds. The ESP warning lamp will light up and the message ESP switched off will appear in the display. The ASR is also deactivated when the ESP is switched off. Press the button again. The message ESP/ASR on will appear briefly on the display. You should switch off the ESP only if your driving ability and traffic conditions allow you to do so safely. Please note that, when the ASR and ESP are switched off, the driven wheels may start to spin, causing the vehicle to lose grip, in particular on slippery or wet roads - danger of skidding! 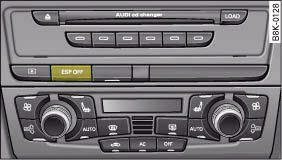 The ASR and ESP cannot be switched off when the adaptive cruise control (ACC)* is on.